There’s probably a misconception out there that all credit cards come with an associated annual fee. While this certainly isn’t true, there are a good number of credit cards that do have an annual fee. But why? Well, some credit card issuers offer special perks, like rewards programs, airport lounge access, cash back, and other nifty benefits to their cardholders. In return, they want you to pay for those special privileges, on top of whatever you pay in interest of course. So when deciding which credit card to get, should you consider credit cards with an annual fee? This question isn’t the easiest to answer, as everyone is unique and has a different reason for opening a credit card to begin with. 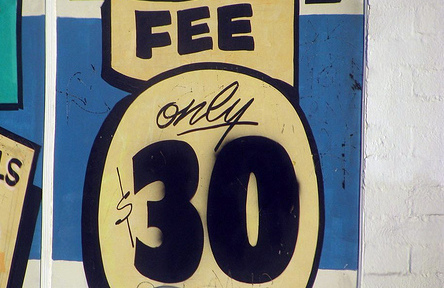 Let’s review a few different situations where you’d be subject to paying an annual fee. Most secured credit cards, which are used to build credit history, come with an annual fee. The problem with these is that they’re often opened as a last resort, because the consumer can’t get a normal credit card. So sometimes an annual fee is unavoidable, assuming you have bad credit. Also note that so-called “monthly maintenance fees” can apply as well, so you may be better served co-signing with someone with good credit or applying for a credit card with your bank or credit union instead. Many rewards credit cards, especially premium travel and hotel credit cards, come with annual fees. For example, the new Southwest credit card has an annual fee of $99, but you get 6,000 bonus points annually, which pretty much offsets that fee entirely. That card also comes with 50,000 bonus points after you make your first purchase, which helps justify the annual fee and then some. There’s also the popular Starwood Preferred Guest credit card, which has a $65 annual fee. It’s a hotel rewards card that comes with up to 30,000 bonus points, so again the annual fee is justified by American Express. And they waive the annual fee for the first year as an added bonus. Another heavy-hitter in the sign-up bonus world is Chase Ink, which offers anywhere from 50k-60k in bonus points if you meet some fairly hefty minimum spending requirements. In return, Chase asks that you pay a $95 annual fee, which isn’t much in the grand scheme of things. Why? First off, they waive the annual fee the first year, and secondly, if you earn the generous sign-up bonus, you’ve basically earned 5-6x the annual fee in rewards. So it is more than paid off for years to come. Compare that to the Amex Platinum card, which only offers 25,000 bonus points in exchange for a $450 annual fee! In all these cases, you need to take advantage of the rewards to justify paying the annual fee. If you simply feel that it’d be “cool” to get a free hotel room or a free flight every now and again, these credit cards aren’t for you. Instead, check out the Blue Sky from American Express, which comes with awesome travel rewards and no annual fee. Hey, who doesn’t want cash back with no fees? We all do, but many of the best cash back credit cards also tend to come with annual fees. For example, the Chase Sapphire Preferred card currently offers 50,000 bonus points, which is good for a whopping $500 cash or $625 toward travel. This is a pretty stellar deal, but the card has a $95 annual fee. Over time, that fee could eat into that initial bonus if you DO NOT use the card a lot and rack up serious points. The good news is the annual fee is waived for the first year. Chase also offers a “no annual fee” alternative via the standard Chase Sapphire card. You can earn 25,000 bonus points, good for $250 cash. Same great cash rewards too, just a bit less lucrative. If you have excellent credit, the Capital One Quicksilver card could be a good option for cash back without an annual fee, seeing that it offers 1.5% cash back all year long. Interestingly, my favorite cash back credit card carries no annual fee. I’m referring to the American Express Blue Cash Everyday card. You get 0% APR for the first 12 months on purchases, 3% cash back at supermarkets, 2% cash back at gas stations, 2% cash back at department stores, and 1% cash back everywhere else. However, if you spend a lot in these categories, it might make sense to pay the annual fee for the preferred version, which offers double the cash back. Do the math before writing off the annual fee version, you could actually lose money by not paying the annual fee! When it comes down to it, these days there are plenty of great options for those not willing (or able) to pay an annual fee on their credit card. So unless you really think you’ll spend enough each year to offset that annual fee, stick with a card without the pesky fee. You might find that you’ll earn more rewards and/or cash back without surrendering a chunk of it to the card issuers each year! However, if you’re a big spender and the card comes with a lucrative sign-up bonus, you could be doing yourself a major disservice to not pay the annual fee. So don’t balk at offers with annual fees, especially if they’re waived for the first year. Do a little math before assuming the annual fee is a ripoff. In many cases, you may be surprised to find out that you’ll earn exponentially more when swiping with a card that has an annual fee. And remember, you can always cancel it at any time if you don’t want to pay it anymore (or before it is ever charged!). Tip: Even if the annual fee isn’t waived for the first year, simply call your credit card issuer and ask them to waive the fee. It’s not unheard of for them to say “yes” simply to snag your business. Yes, you must be a good customer to make such requests. Additionally, if you’re in the military or the reserves, there’s a chance your credit card issuer will waive your credit card’s annual fee if you let them know you serve our country. It’s not a guarantee, but it certainly doesn’t hurt to ask. They may lower your interest rate or offer some other perk as well.